Beautiful Incentives: Hello Kitty Giveaway! Ah, Hello Kitty. Who doesn't love Hello Kitty? If you aren't the type to adore her, I'm sure you make up the minority. She is a cute lil Sanrio Classic, and I don't think it's possible the character will ever go out of style. Onto the goodies! Recently, I found the cutest Hello Kitty decked out items. I've also been collecting over the past year, only to realize, I really should donate to someone. I never use the things, I just adore the design and packaging. Alas, the eye candy would be better suited for someone who could enjoy them for what they were intended for. This Hello Kitty Giveaway consists of some basic items I have encountered from the Hello Kitty line. My favorite of the bunch? The Hello Kitty tooth brush. It suction cups to your counter, has a cap for sanitation. (I think they should all come capped) and get this: the cap has eyes that open when you pick it up and close when you put it down. Somewhat creepy, yes, but 99% cute! Do I have one of my own? Why yes, i do! I know a little girl or collector crazed woman would get much better use out of these. I'm sure this isn't the end of my collecting, and probably just another excuse to buy more! Let's kick off this 4th of July with an explosion of cute! My daughter would love these. She is all about Hello Kitty. *I* would love this!!!! <3 lol CUTTTTEEEEEE!!! I love Hello Kitty!! I have since my younger days!! I absolutely love hello kitty. All things hello kitty simply make me smile. 2 girls who love Hello Kitty! Love the giveaway! My 7 yr old niece LOVES everything Hello Kitty!! I am going to see her this summer on a family trip and her birthday is just a few weeks after that, so this would be perfect for her as an early birthday present since I won't be with her on her day. My daughter just moved away from home and she LOVES Hello Kitty...this would make a SUPER FUN and unexpected Surprise for her to get in the mail at her new address. My daughter and I both love Hello Kitty and this would be the perfect grab bag for her to take to college. For my daughter!!! She loves hello kitty!! I want this for my grand daughter Lily. She is nearly one and this is so cute and would be so cute on her! I would love to have this for my daughters birthday. It would make great prizes for the games we play. It can be shared with many of the girls. Because my cousin loves Hello Kitty!! love hello kitty anything kitty!!! i got 5 real kittes!! love kitty stuff yeah!!!! I would love to have this because I myself and daughter love Hello Kitty. I love Hello Kitty. She's my best friend! I want this because I don't have any Hello Kitty in my home, and that's just not right ! Because it's so cute! Three of us here would LOVE it! i HAVE GOT to win this! You do NOT know how badly! I have been a serious HK collector since I was 5 and got my first pencilbox. I went to the Mall of the Americas just to hit Sanrio. I live in Alabama, what business do i HAVE in Minnesota? That's right, HK!!! I have the vacuum cleaner, roasting oven, toaster, waffle maker, cd player, mini fridge, the big BIG kitty doll, the Japanese-based smartphone....ah, everything! Well...not quite...I WANT THIS SET!!!! Help me win!!!! My little great-nieces love Hello Kitty! They wanted some of these things last time I went shopping with them but I couldn't afford to buy for them. It made me feel so bad but there wasn't anything I could do about it. Winning this would make them as well as me so happy! I would love to win because my daughter's birthday is coming up and she would love this. I want to win this because my little girl absolutely loves Hello Kitty and it would make her happy! I want this because my daughter has loved Hello Kitty since she was little and she is having her 2nd daughter tomorrow!!!! My daughter and I are huge Hello Kitty Fans and would love to win! My daughter loves hello kitty and would love to win this ! I want it because my sister's birthday is next month and she adores Hello Kitty. This would be a great gift! Would love to give this to my niece. My brother got laid off and my sister-in-law is down with a bad knee so things for them are tight. This would definitely bring a smile to her face. 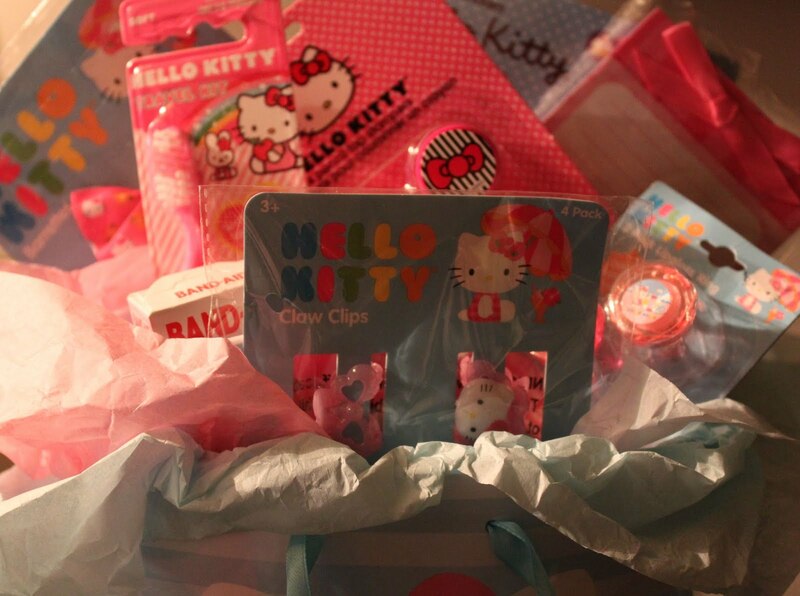 To win this would make my daughter the happiest Hello Kitty fan around!! My little sister loves hello kitty! I would love to give this to my wonderful bridesmaid Baylee! She loves hello kitty! why wouldnt i want this? I want this because i love hello kitty!! My granddaughter would love this! She adores Hello Kitty! I want to win this as a gift to my friend's daughter, Claudia - she would absolutely love the whole package. 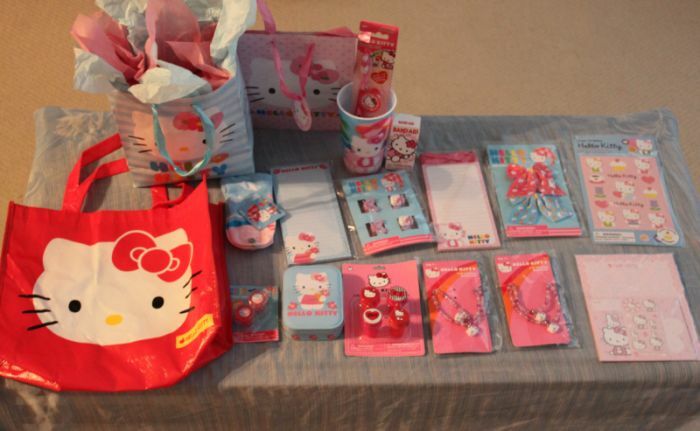 I would love to win this because me and my daughter are both huge Hello kitty fans. I would love to win this because I am a huge Hello Kitty fan, and I would like to share it with my daughter. bc HK is amazing and part of my childhood of musing the mall and walking amongst the sanrio store for hours and hours!!! My niece loves Hello Kitty and she would absolutely love this! I WANT THESE ITEMS FOR MY GRANDDAUGHTER, EMILY, WHO WOULD THINK THAT IT WAS THE MOST FABULOUSLY PINK PRIZE PACK EVER! THANKS FOR THE GIVEAWAY AND WISH US LUCK! I want this for my daughter she loves Hello Kitty and I think this would be a fabulouse prize ever for her. My 4 yr old munchkin is in love with hello kitty! She'll die! I'd like it because my daughter would love it and I could surprise her with it. I was searching Hello Kitty and came across your blog! What luck! I am a big Fan of Hello Kitty have been since I can remember! Thanks for a great giveaway! Good Luck! Because Hello Kitty is adorable! Marioswifey, you are the winner!! !